Scoliosis is defined as a lateral deviation of the spine, however, the true definition of scoliosis is slightly wider. Scoliosis is a three-dimensional deviation of the spine: the involved vertebrae of the spine shift laterally (sideways), rotate backward on the convex side (creating a rib or lumbar hump) and change their sagittal (front to back) position. The diagnosis of scoliosis is made when the angle between the most tilted vertebrae (Cobb angle) involved in the curve is more than 10 degrees. There can be many curve profiles in scoliosis and there is no known cure. Scoliosis can often be progressive and affected by many factors; however the chance of progression is increased relative to degree of the curve and earlier age of onset. Does conservative treatment have a role in the management of scoliosis? Effective scoliosis treatment requires a specialised approach. The Schroth & SEAS method of scoliosis treatment are the worlds’ most validated methods of effectively treating scoliosis. These methods involve a therapy plan of specific exercises to correct scoliotic posture in the assumption that scoliotic posture promotes curve progression. This is achieved by applying Katarina Schroth’s 3 Dimensional Correction technique and protocol to the patient’s current existing curve profile. 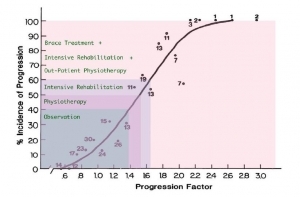 The first part of the Schroth Method protocol involves a comprehensive assessment and deconstruction of the components of the scoliotic curve followed by a workshop period where the patient gets to understand and internalise their existing curve profile. This involves x-ray analysis, physical measurements, exercise and discussion. The Schroth Method is applied through a systematic series of postural corrections that are dependent on the curve profile. Over a series of sessions, the systematic corrections are taught in a variety of starting positions. Once we have achieved corrected posture performing RAB, we teach the patient activation exercises to strengthen the muscles that are required to maintain the new corrected posture. This is achieved by applying Katarina Schroth’s 3-Dimensional Correction technique and protocol to the patient’s current existing curve profile. Schroth programs are individual and are suitable for all age groups. The first part of the Schroth Method protocol involves a comprehensive assessment and deconstruction of the components of the scoliotic curve and then a workshop period where the patient gets to understand and internalise their existing curve profile. This involves x-ray analysis, physical measurements, exercise and discussion. The Schroth Method is applied through a systematic series of postural corrections which are dependent on the curve profile. Over a series of sessions, the systematic corrections are taught in a variety of starting positions. Once these postural corrections have been achieved, the patient is then ready to commence specialised Right Angled Breathing (RAB), which is an essential component of the Schroth Method. The aim of the breathing is to expand the collapsed areas of the thorax and flank as well as to counter-rotate the chest wall and floating ribs in the abdomen. We don’t believe that physiotherapy and exercise can cure scoliosis but we have had significant success in altering the postural schema from a muscular viewpoint resulting in reduced pain and improved posture and functional tolerance. We hope the above information is useful. Please contact us at UprightCare if you should have any queries or concerns. Thank you to PhD candidate Sanja Schreiber in Alberta, Canada for clarifying the information on current international research. There are currently 3 international trials underway investigating scoliosis. The Canadian trial is a randomized controlled study on Schroth Method exercises for scoliosis. The Warwick University (UK) is running a feasibility study (not randomized controlled trial) on specific exercises designed to strengthen trunk muscles and improve balance in scoliosis. The Karolinska institute in Sweden is in the early stages of a randomised clinical trial assessing scoliosis specific exercises. Initial data of the Canadian (part SRS funded trial) presented at SOSORT 2013 shows a positive effect. At UprightCare, the intensive Schroth Method programme consists of five two-hour sessions including an extensive initial assessment and a DIERS formetric spine & posture assessment. The sessions are two hours duration to ensure a comprehensive understanding and knowledge of your curve profile and exercises. Local patients can schedule an initial postural assessment and we will work out a suitable program. In some cases an intensive program is recommended but other cases standard outpatient protocols are sufficient. We encourage our patients to complete the first five sessions within a week or two to ensure knowledge is gained and maintained without disruptions in between (although we can cater to specific needs and requirements). *If you would like to organise your own pads and strapping please contact us and we will send you the information on how to make you own. Eligible patients may be entitled to a Private Health Fund rebate. In addition, if you are eligible for a Chronic Disease Management Plan (CDM)* you may receive a Medicare rebate of $52.95 per session. *Furthermore if you reach the Medicare Safety Net for the year – Medicare will reimburse up to 80% of all medical related costs. Please contact Medicare directly for more information; it is essential to register for the Safety Net. Pricing is as above however, you will be required to attend the Schroth Method therapy for five two-hour sessions within one week to obtain maximum benefit and knowledge prior to returning home to continue your Schroth Method exercises independently. In all cases it is essential to check availability with us before making travel arrangements. We will do our best to accommodate your schedule. A follow-up is usually required approximately six months after your initial program. We are located within the heart of Bondi Junction, inside the commercial suites of the Meriton Apartment building where accommodation is available. We are adjoining the train station and bus depot, making it easy for you to do other activities whilst in Sydney. Bondi Junction is a large shopping area and Bondi Beach is a short bus ride away. X-rays: Please bring your old x-rays with you. If you do not have any x-rays or require new ones, please contact us and we will give you a referral for an EOS Scan. For females: a bikini top, bra or sports top that you are comfortable in (not a t-back) as we need a full view of your spine. We have a private gym area however other patients may use the room at the same time and we wish to respect your modesty. Conservative treatment has no role in the management of scoliosis – or does it ? Scoliosis is defined as a lateral deviation of the spine, however the true definition of scoliosis is slightly wider. Scoliosis is a three dimensional deviation of the spine: the involved vertebrae of the spine shift laterally (sideways), rotate backward on the convex side (creating a rib or lumbar hump) and change their saggital (front to back) position. The diagnosis of scoliosis is made when the angle between the most tilted vertebrae (Cobb angle) involved in the curve is more than 10 degrees. There can be many curve profiles in scoliosis and there is no known cure. Scoliosis can often be progressive and affected by many factors; however the chance of progression is increased relative to degree of the curve and earlier age of onset. There are different types of scoliosis (commonly defined by age of onset) and the most common is Adolescent Idiopathic Scoliosis (AIS). The remainder of this article will primarily address AIS and provide some insight into the decision making process around conservative management of AIS. There is no doubt that there continues to be controversy with regard to the role of conservative (non- surgical) management in scoliosis. There is a dearth of quality information as seen in Figure 1. 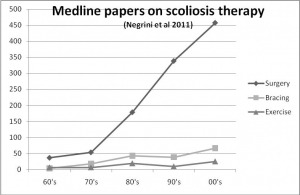 Figure 1: (Negrini et al): A Medline search of all papers on scoliosis shows that there is a massive difference in the amount of good quality research into conservative management when compared to surgical management of scoliosis. There are however many groups who are beginning to publish good research into conservative management. Additionally, there are currently 2 international groups conducting a randomised trial of Schroth treatment in scoliosis. One group in Canada in a dual SRS, NIH funded trial under the auspices of Dr Eric Parent and one group in England in a NHS funded trial under Warwick University.Therefore, although there is no published evidence proving that Schroth works there must be some benefit which has convinced these independent bodies to contribute funds to these trials. SOSORT (Society on Scoliosis Orthopaedic and Rehabilitation Treatment) is an international group whose members include surgeons, doctors, physiotherapists, chiropractors and bracing specialists who have a special interest in treating scoliosis. SOSORT members believe in a team approach to the management of scoliosis using all available techniques, including surgery, bracing and in some cases; specific exercise therapy. SOSORT decision guidelines1 are assisted by the following graph (Figure 2), which is based on Lonstein and Carlson’s progression estimation formula. Figure 2: Progression risk above 40% is an indication for intervention. If conservative management is unsuitable or fails then surgery is indicated. The formula was originally based on curves 20-29 degrees so this needs to be taken into account with larger curves.For example, a 12 year-old girl with a 30 degree cobb angle and Risser 0 results in a progression factor of 2.5 (30 degrees – (3 X 0) divided by 12. The risk of progression is 90%. The treatment recommendation is bracing with exercises with close monitoring and surgery if required. Curves below 40% risk of progression are initially managed by observation alone however curves at greater risk of progression require intervention. The intervention can be specialised exercises, bracing or surgery. There are many type of braces available but it is important to note that the person fitting the brace needs expert knowledge of scoliosis and tracks the brace effectiveness with in-brace as well as out-of-brace x-rays. The patient will need to exercise to reinforce the brace action and strengthen their musculature to ensure that there is no collapse upon brace weaning. Furthermore the patient needs to be taught to internalise new body image awareness and reflex curve correction. The curve correction is a highly specialised specifically choreographed order of movements encompassing all the dimensions of the curve. Stokes in 1996, 2000 and 2006 continued to expand on his resurrected ‘vicious cycle’ concept. The idea is that a triggering event to precipitate the asymmetrical loading of the spine will result in assymetrical growth of the vertebrae, wedging of the vertebrae and hence an ever-increasing spinal curvature. Simplistically; a small curve can eventually reach a threshold whereby gravity and mechanics alone can cause the curve to progress. This is especially relevant during the growth phase. Logic dictates that reduction in the asymmetrical loading will reduce some of the inherent load of this vicious cycle. Schroth therapy is one of the ways of restoring balance and symmetry to the spine. How does Schroth therapy work? The asymmetry of the curve needs to, identified and deconstructed. The deconstruction of the curve profile is analysed according to the principles of Katarina Schroth who was noted for scoliosis treatment in 1925 founded her clinic in Germany in 1961. The method has been refined over the years but the principles have remained unchanged. Once the curve is analysed, the patient is taught a choreographed sequence of movements, breathing action and muscle contraction to lead to greater symmetry of the body. Conservative management has a role in scoliosis treatment. Conservative management does not replace surgery. Bracing is effective in scoliosis treatment but needs to be applied, monitored and weaned correctly. Exercise therapy is highly specialised and needs to take into account the 3 dimensions of the curve. Saggital curve profile is an essential component of scoliosis and incorrect self correction can lead to detrimental loading of the curve. Scoliosis is best managed and treated by a team of specialist bracing, surgical and exercise practitioners. 3. Self-Correction of posture: Assessemnt of the quality of the movement accomplished by non-instructed school children. Stolinski L & Kotwicki T. Proceedings of the Annual meeting of the SOSORT, Barcelona 2011.